Driver: A driver is the cone or circular portion of a speaker that moves back and forth to produce sound. Sometimes speakers with several drivers will be distinguished as midrange, mid-bass or bass drivers, which describes their role in reproducing some part of the frequency spectrum. Cabinet: The structure in which a speaker’s driver(s), tweeter(s) and crossover components are housed. Crossover: A network of parts that break up a sound signal into different frequency bands and direct them to the appropriate driver or tweeter for sound production. Port: A hole that is placed in a speaker’s cabinet in order to enhance its bass response. Satellite: A very small speaker made to fit in areas where space is at a premium. Satellite speakers generally have a main driver of 4 inches or less, and a tweeter. Some have drivers so small that a tweeter is not necessary. Because the drivers in satellites are so small, they usually produce little to no bass. Satellites come in all sorts of shapes: cubes, spheres, rectangles…you name it. Bookshelf speakers: The next step up in size from satellites. There is some grey area here because some folks call larger satellites “bookshelf speakers” anyway, but for our purposes here, a bookshelf speaker will usually have a driver of 5.25 to 6.5 inches and a tweeter. Depending on how well they are made, bookshelf speakers can produce some bass, but they don’t get down very low in the bass spectrum. Monitors: Monitors are like oversized bookshelf speakers. These can have a driver size of 6.5 to 8 inches and, because of larger drivers and larger cabinets, most monitors can produce some pretty significant bass power and get down reasonably low. Floor-standing or tower speakers: As the names imply, these types of speakers sit on the floor and are tall enough that a speaker stand isn’t needed to get them to the right height. Floor-standing or tower speakers usually (not always) have multiple drivers and a tweeter. The size of these drivers can vary from 3.5 to 12 inches in diameter and it is not uncommon to mix in several different sizes. The bigger the drivers are, the larger the cabinet is likely to be. 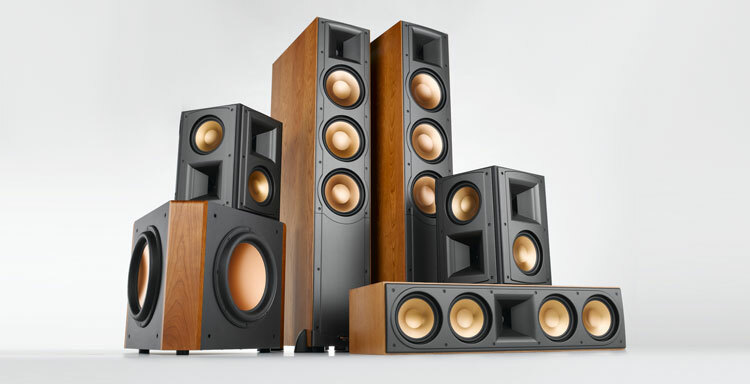 Some floor-standing speakers today use multiple, small drivers and are so slim that they take up less space than a bookshelf speaker on a speaker stand. Subwoofer: The subwoofer’s job is to produce bass. A subwoofer is usually a 6.5- to 15-inch driver mounted in its own cabinet, no tweeter. Active subwoofers have their own amplification. Passive subwoofers (rare these days) require amplification from another source. Subwoofers can be used to fill in the low frequencies for smaller speakers, or cover the extremely low frequencies in a home theater system. Mains/Front L/R: Refers to the main two speakers in a system. For music, the main left and right speakers will do most of the work. For home theater, the mains will take care of a lot of sound effects, particularly the sounds of things happening just off-screen. Center channel: In home theater systems, the center channel is responsible for reproducing dialogue and some sound effects. The center channel is meant to be placed just above or below a TV or projection screen to give the impression that the voices are coming from the screen. Surrounds: In home theater systems, the surround speakers are responsible for directional sound effects. The surround speakers are supposed to be placed just to the side and just behind the listening position (i.e. your couch, easy chair or theater seating). Surround speakers can sometimes be smaller than the main speakers in a system. Back surrounds: Also referred to as rear surrounds, these are surround speakers that are meant to be placed in the back of a room, facing toward the TV or projection screen. The speakers, work in conjunction with surrounds to provide a realistic sound-field behind the listener. Front-height speakers: A relatively new addition to home theater, front-height speakers are usually placed above and between the two main speakers. The idea is to provide a little more height to the sound-field, making the surround sound that much more convincing. Front-width speakers: Also a new addition to home theater, front-width speakers sit to the left and right of the main speakers and slightly forward. The goal of these speakers is to help bridge the gap between the mains and the surrounds. Also check out our Ultimate surround sound guide: Different formats explained.